P.S. (that’s ‘pre’ script!) I left my turkey in the pan even though the bottom of it blackened. Yup. It happens and even though I love my blog I am just not the kind of girl who is going to place her turkey on a pretty platter just for a photo. Who has time!? So I got myself an organic turkey yesterday for $3.99/lb. For a nine pound bird that’s, ahem, close to FORTY DOLLARS. 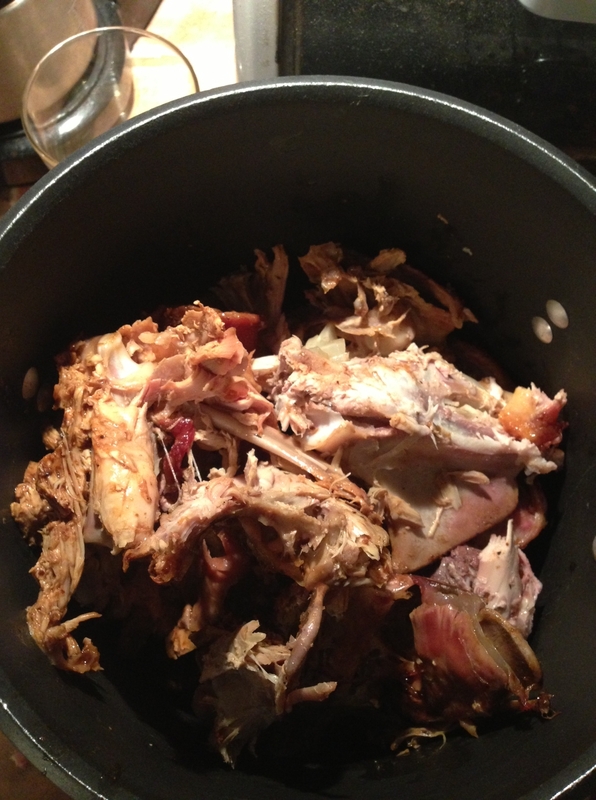 How the heck does the full time homemaker–married to a public school teacher–swing a 40 buck-bird for dinner? Well I am just so glad you asked. Then, on top I used the following ingredients: 1/2 cup white wine, 1/2 cup orange juice, drizzle olive oil. Sprinkle top with whatever yummy stuff you’ve got in your spice drawer. I used several dashes of thyme, garlic powder, garlic salt, black pepper and I think some oregano. 3. Also just like when I cook a chicken I set the oven at 425 degrees and cook for 25 or so minutes. Then reduce temp to 325 and cook approximately 25 minutes per pound. This was a 9 pounder so I left it for about 2 1/2 more hours. I checked it at about 2 1/4 hours and it was done. How did I know this? My handy meat thermometer (inserted into thigh after taking out of oven to check) read just above 155 degrees. 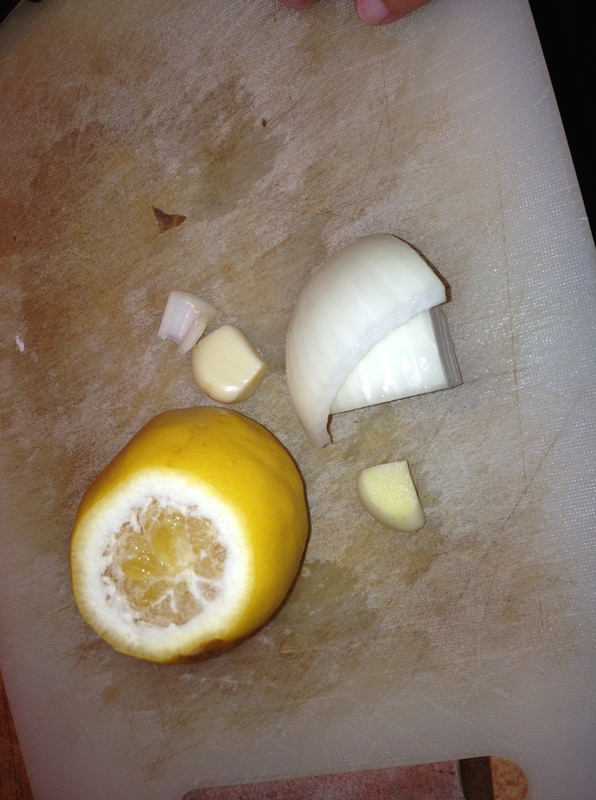 This is, in fact, my favorite part as I will boil these bones in water (with the lemon, onion and garlic) for about 90 minutes to get the most delicious broth you’ve ever tasted. If my house smelled good with the turkey in the oven, just imagine what it will smell like with these bones simmering away. Yu-uhm. If you do the math now, I spent about 40 bucks on the turkey, but if I use it for four meals for five people that’s around $2.00 per person per meal. For organic turkey that’s pretty good, right? And if I can squeak another meal out of the meat I could drop that cost even more. How many recipes can a girl make with turkey? Again, so glad you asked. Turkey soup is coming pronto. I’m also thinking about turkey enchiladas, toasted turkey sandwiches and maybe turkey fajitas… or maybe turkey stir fry… or wait… so hard to decide! 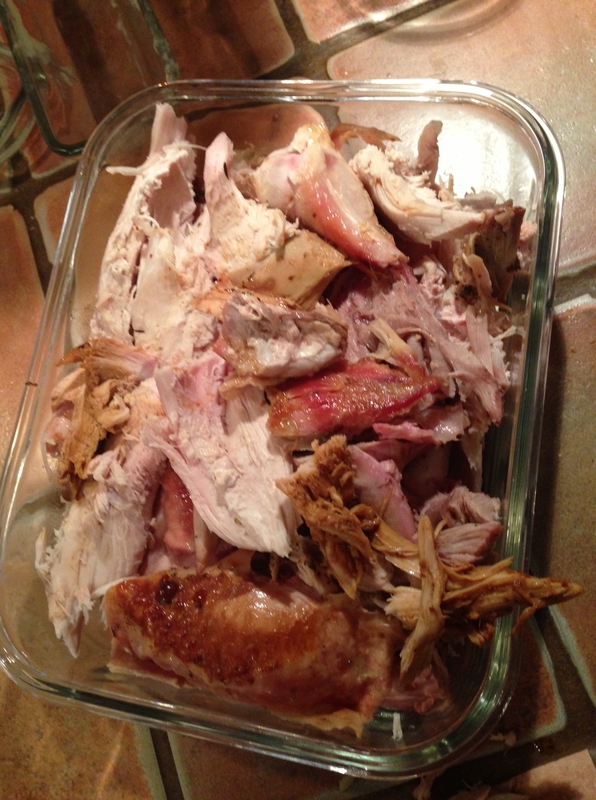 Do you want to see my recipes for turkey leftovers? (yes.) Coming soon! 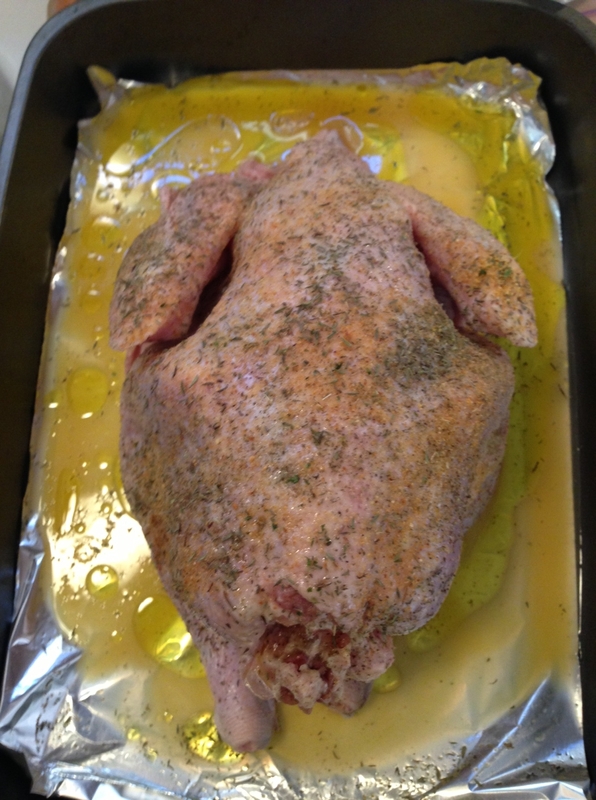 Ingredients: 9 pound turkey, two garlic cloves, 1/4 onion, fresh lemon, 1/2 cup OJ, 1/2 cup white wine, drizzle olive oil, generous dashes of garlic salt, garlic powder, black pepper, thyme and oregano. 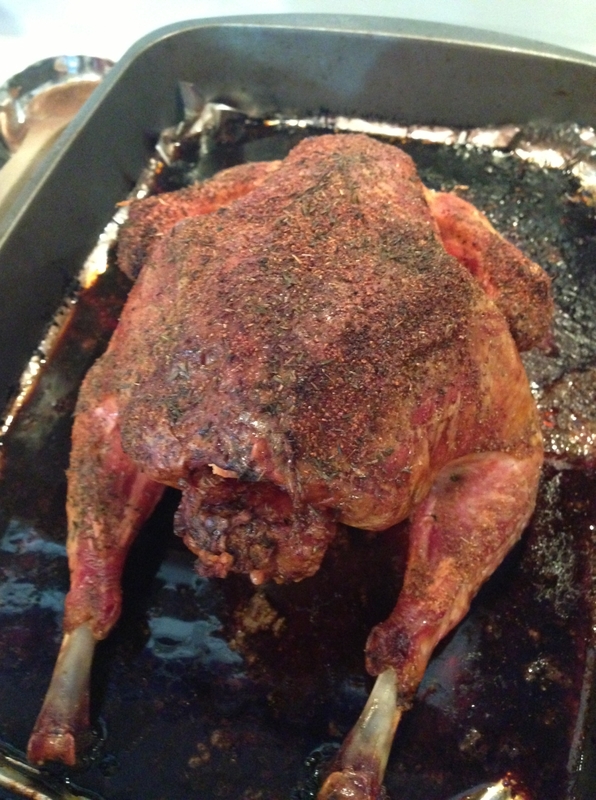 Direction recap: Cook at 425 for 25 minutes and then lower temp to 325 and cook for 25 minutes per pound. Internal meat temp should read 155 when done. Tips: I place a piece of aluminum foil in the bottom of my roasting pan to help with cleanup. Also, I added water this time about 1/2 way through roasting as the sizzling pan started to create a bit of smoke.